i´d love to try one of those.. looks like a lot of fun! For some reason I feel like jumping out of a plane while I'm inside one of those balls..
Wonder what would happen when I hit the ocean.. Would the ball help me survive the dreaded surface tension? then i was thinking.. how long before you run out of oxigen? considering you are running therefor consuming more oxigen?? 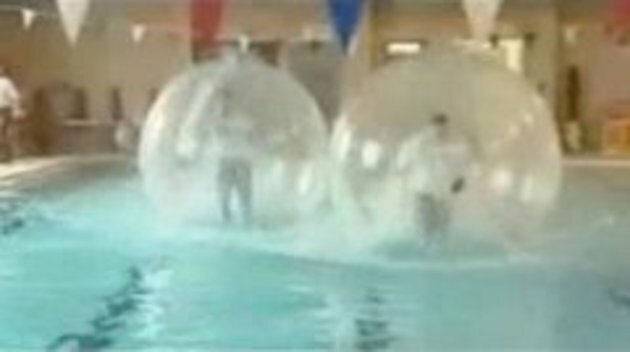 I look forward to the "Hamster Ball Swimmer Drowns" video which is sure to follow this at some time in the future. Looks like hard work, I'll skip it thanks. On another note just how retarded do you have to be to make a double post, I still have not figured out how you guys manage to do it, some of them are hours apart, how, how. You click post and move on, it is not hard. I guess its hard to make stuff fool proof since you fools seem to be so ingenius. They must deplete oxygen rather quickly. I did something like that! I was inside a hasmtermill,so you can breath, it's realyy fun to do! I've seen a lot of apologies about double posting here on Snotr, and the most of them usually involve people posting a comment and then leaving their computers to then return hours later and hitting Refresh/F5. Which then of course leads to a post being submitted twice with hours in between. #9 "just how retarded do you have to be to make a double post,"
Be patient your almost there don't feel left out. Where can I buy one of those balls? I would LOVE to try that! That looks like a lot of fun. They have airholes*, you know. The water just doesn't go through the hole. Like the hole in a kayak. I think I spelled that wrong.